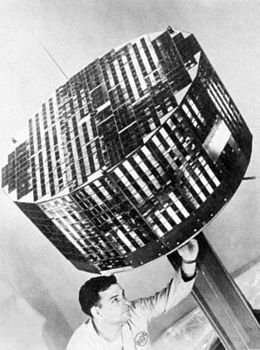 On 23 November 1960 the TIROS-2 satellite was launched from Cape Canaveral, Florida, aboard a Thor-Delta rocket. 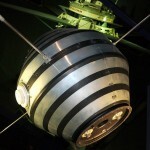 Also known as TIROS-B, the satellite’s name indicates that it was the second Television InfraRed Observation Satellite. The TIROS program was NASA’s first step in using satellites to study the earth – meteorology being the most promising application. 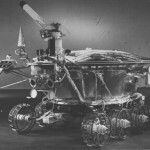 TIROS-2 had two television cameras for imaging cloud cover, as well as radiometers for measuring infrared radiation from earth and the atmosphere. 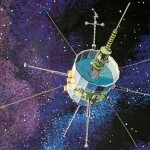 It was the first satellite to make infrared observations. The craft was a 127 kilogram, 18-sided right prism 107 cm in diameter and 56 cm high constructed from aluminum alloy and stainless steel and tiled with 9260 solar cells which charged its nicad batteries. Magnetic tape recorders stored photographs while the satellite was out of range of the ground station network. TIROS-2 used five diametrically-opposed pairs of solid-fuel thrusters to maintain its spin rate. Its axis could be oriented with a high degree of precision by the use of a magnetic attitude control device – 250 cores of wire wound around its outer surface. 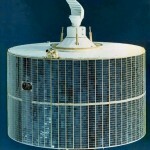 The spacecraft relayed thousands of pictures containing cloud-cover views of the earth until 22 January 1961, when the scanning radiometer began to deteriorate. It was operational for 376 days in total. TIROS-2 remains in orbit today, with some associated debris. TIROS-2 is expected to decay from orbit on or about 5-16-2014 +/- 1 day.